The Harriers will be travelling to Northwich tomorrow evening with the full intention of claiming another three points and in doing so make up for the shock defeat against Barrow on Saturday. After being un-beaten at home all season, and also since March when we hammered six past Stafford Rangers, it was a shock to the fans and team alike to be beaten in such a way. Barrow came to Aggborough with the full intention of defending and then hoping to catch us on the break. To catch us as early as the fifth minute was cruel but we never really looked likely to get anything from a game that was also being spoiled by one of the worst refereeing displays in a long, long time. The Vics should be the ideal team to feel the backlash with them being marooned at the bottom of the table and seemingly incapable of getting a win of any kind although they did beat our tormenters from Saturday a couple of weeks ago. That 2-1 victory at home to Barrow was their only win of the season so far. As is usual for Northwich the off field antics seem to over shadow the football itself and last week they sent the manager Dino Maamria home to cut the grass and tidy up the leaves for a bit. 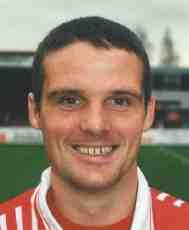 The former Harriers legend Mike Marsh is now caretaker in charge there and his first game came at Kettering on Saturday when they lost 2-1 after taking a first half lead. Schoolboy defending gave the Poppies the points after Northwich looked good bets for at least a point. They'll be without Lee Steele for the game against us after he fractured his tibia and there are also doubts over Richie Sutton too. We should be going with the same starting line-up once more but there could be a change on the cards sooner or later if Russ Penn continues to turn in poor performances such as on Saturday when he was anonymous for the majority of the game. Neil Mackenzie is waiting in the wings and his second half showing gave us a small glimpse of how much better he is at the moment. We always seem to do well at Northwich and I don't think an exception will be made this time. We should be coming home with three points from this one. Nothing less will do. Bartlett, Coleman, Baker, Riley, Lowe, Ferrell, Creighton, Bowler, L Jones, Knights, McDermott, Bennett, Mackenzie, Brittain, Penn, Barnes-Homer, Smikle, Richards. Tynan, M Jones, Almeida, Sutton, Brown, Welch, Roberts, Crowell, Mullan, Byrom, Allan, Barratt, Flynn, Bailey, Byrne, Aspin, Burns, P Marsh, Barnes, Williams, Stamp, Grand, King.